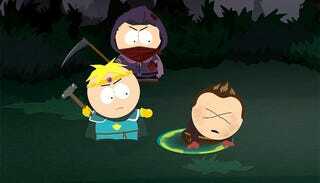 Here's the bad news: South Park: The Stick of Truth is still full of bugs. In fact, yesterday, after patching Obsidian's latest role-playing game and jumping back in for the first time since early March, I discovered a new one: Cartman's walking animation stopped working, leading to some hilarious moments as I dragged an inert, zombie-like fat kid around the town of South Park, trying to get his feet moving again. That's on top of previous errors I ran into on the Xbox 360 version of Stick of Truth, including a crippling stuttering glitch that throttled my game's framerate every time I took a few steps. Unfortunately, Obsidian's got no new patches planned for the immediate future, and it doesn't seem like they're planning on fixing the stuttering issue that came close to ruining my whole experience. So this seems like a good time to revisit our review. NOT YET turns into YES. Why? Because when I ask myself "even knowing that these issues won't be fixed, would I still tell a friend to play Stick of Truth?" the answer is always yes. It's a great game, with top-notch writing, smart level design, and ridiculous battles that never overstay their welcome. Though I waited to recommend it in hopes that the folks at Obsidian would fix some of those bugs—and though I still wish that would happen—Stick of Truth's merits outweigh its technical flaws. This one's a yes.